Color and appearance plays an important role in shaping customer perception of white goods or household appliances. Customers often evaluate the quality of appliances based on their appearance. For manufacturers, the ability to produce the right color and appearance consistently is not only a statement about their product quality, it is important to their brand as well. Attributes like color, gloss, haze and orange peel contribute to the aesthetic appeal of a product. A meticulous color and appearance control and management, from raw material to finished goods, helps ensures perfectly color-coordinated components and high quality appliance finishes. Apart from color and appearance, display performance of household appliances must also be evaluated for uniformity and precision. Backlighted indicator like touch sensor buttons are checked for color and luminance consistency and uniformity. Displays are tested for their legibility under various visual conditions and viewing angles. 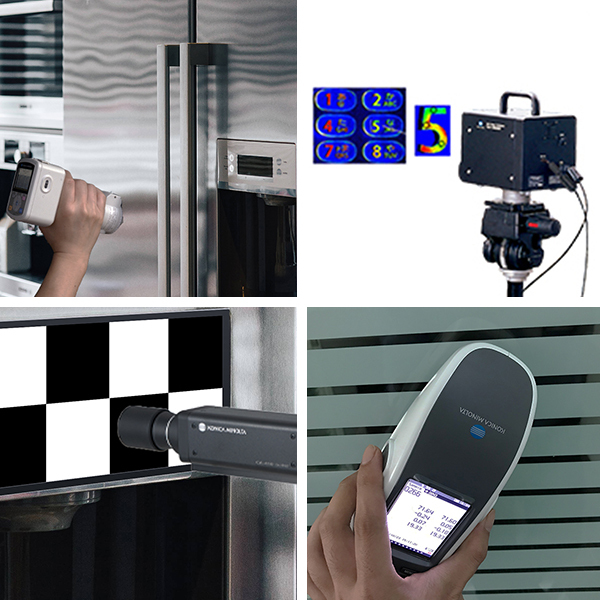 Konica Minolta sensing instruments and solutions are widely used in appearance and display performance evaluation. Color Analyzers, Illuminance Meters and Luminance Color Meters help ensure display performance and quality standards are consistently met. Spectrophotometers and Goniophotometers can help specific, communicate, control and verify appearance and color objectively and consistently. Check out our testing and measurement solutions for white goods applications to learn more. Alternatively, write to us for a free product demonstration or consultation with our specialists.